Invoiced as follows: $300 Deposit (applied to puppy price above) due immediately with signed “Page 4” of your contract; Once puppies have arrived, we will invoice you for the First Payment (1/2 of your remaining balance), due at 4 weeks of age; Final Payment (the remaining balance) due at 6 weeks of age (or at your Picks visitation.) Invoices for training are due at 8 weeks prior to puppy transferring to training. Once you fill-out an online application, we will schedule you for a call to discuss litter options and timing available to your family for bringing home your new pup! When you decide to move forward with a particular litter, we will generate a contract specific to your Pick number and the litter you choose. Your return of this contract along with your deposit of $300 will hold your spot on the litter you have chosen. Non-refundable, but transferrable. Your DEPOSIT is non-refundable. However, if you decide to wait for a subsequent litter, your deposit will transfer your reservation to another litter. Your Pick number will be based on the availability of the litter you choose. Once your puppy transfers to training, no part of your trained reservation payment may be refunded. Our contracts with trainers must be paid according to the reservation. We are sorry, but we will not be able to refund your training payment under any circumstance. Let’s start with the cost of owning our girls and boys. Puppies intended for breeding cost double and sometimes triple the purchase price of the same puppy intended as a pet. Purchasing a breeder is one thing, but after we purchase, we test! We have spent much money and time testing our breed fleet so we can make sure we are breeding genetically sound puppies. If you have done much checking around, you know transparent genetic testing is highly recommended and not easily achieved. 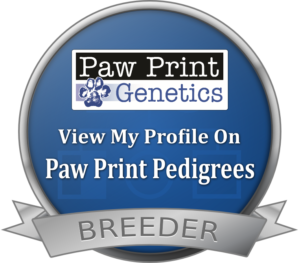 See for yourself how dedicated we are to this at Pawprint Pedigrees! Next, as you can well imagine we want the healthiest puppies we can possibly provide for our customers. This means we go to the vet pretty often. 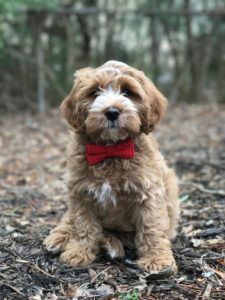 Routine veterinary care as well as multiple diagnostic and genetic tests to confirm healthy breeding stock can cost between $1000-$2000/dog (boys and girls) before the first litter even arrives. After the puppies arrive there are hundreds of more dollars for vaccines, dew claw removal, and well checks. Food & treats. A dog’s gotta eat! And though some of them be little, yet they be hungry! Top notch customer service, photography, and a social media presence you can be proud to be a part of: these are things that matter to us and matter to you. They don’t break the bank, but the cost is something we have to consider as we price our puppies. Our aim is to provide ongoing support to our customers. In rare instances this will mean that we will refund a customer the purchase price of their puppy. In other rare instances we will replace their puppy with another, healthier one. It’s just the right thing to do. Crossfield hopes that these brief answers explain why we and numerous other breeders price our puppies as we do. 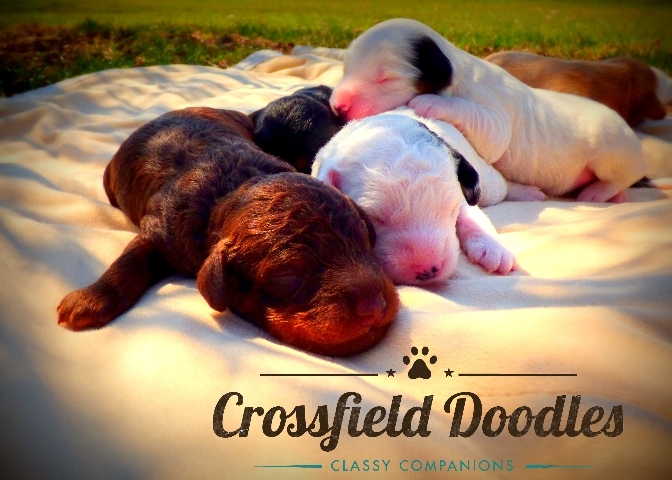 We are confident that Crossfield Doodles’ customers will get exactly what they pay for!